Getting bored of sitting at the same old table every day? Here are some new spots that might spike your interest. The LEC is a great place to go during break or lunch if you are looking for a quiet, relaxed space to do homework, sit, or chat with friends. With lavish sofas and group-oriented tables, the LEC offers both comfort and style. However, there is no food allowed so make sure you eat before you visit. The comfy chairs in the LEC. Photo taken by Izzy Lopez. The front lawn is another fun place to sit. You can bring a blanket and sit on the grass with your friends or now, as Rosary has recently invested in some killer lawn chairs, if you’re quick enough, you can grab a spot and sit there. The front lawn of the academy. Photo by Izzy Lopez. 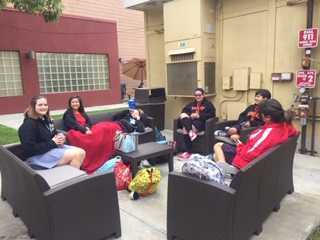 Last but not least, in the area near the Karcher Center and the portable classrooms, there is some new patio furniture, including some comfy couches and umbrellas, for your leisure. 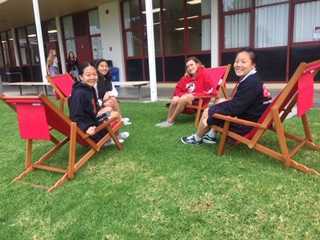 You and your friends can sit back and talk during breaks from the draining classes that occur at Rosary Academy. The new couches. Photo by Izzy Lopez. Now that you know of these new places to sit at instead of the lunch tables, make sure to check them out and change it up from time to time.